The fighting between Russia and Georgia was the biggest story in the U.S. media last week, marking the first week in nine months when the presidential race did not generate the most coverage, according to a new report from the Pew Research Center’s Project for Excellence in Journalism. The conflict in the Caucasus, which raised the specter of a re-ignited Cold War, accounted for 26% of all the overall coverage last week, according to PEJ’s weekly News Coverage Index for the week of Aug. 11-17. The campaign, at 21%, generated its lowest level of weekly coverage since last December—before the first caucus or primary vote was cast. The crisis in Georgia also quickly became a major campaign issue. Stories about the conflict primarily involving the candidates’ views were the No. 1 election storyline, accounting for 14% of the campaign coverage studied by PEJ. For the ninth time in 10 weeks, moreover, Obama generated more coverage than his rival, even during a week when he was vacationing. The Democrat registered as a significant or dominant factor in 63% of the campaign stories studied, compared with 50% for McCain. But it was a week that offered a reminder that more does not necessarily mean better. Last week McCain reaped some positive coverage for his aggressive approach to the crisis between Russia and Georgia. And a number of post mortems gave him good marks for his performance during an Aug. 16 forum on values and religion at a California mega-church. At the same time, Obama again faced a media narrative focused on a divided Democratic Party and his tricky relationship with the Clintons. Another major storyline last week also did not bring good tidings for Obama. A new attack book called “Obama Nation”—from the man who co-authored “Unfit for Command” about John Kerry in 2004—accounted for 6% of the campaign news. Even as stories questioned author Jerome Corsi’s accuracy and motives, the book made Page 1 of the New York Times and Washington Post and Corsi hit the talk show circuit in a major way. With the war in Georgia leading the campaign discussion and the economy accounting for another 5% of the narrative, all the policy issues combined accounted for 23% of the week’s campaign coverage. Once again, however, the episodic nature of the campaign was highlighted as coverage of energy policy fell to less than 1%. Only a week earlier, it had been the No. 1 election theme, accounting for 23% of the coverage. All of these findings are part of PEJ’s running content analysis of media coverage, called the News Coverage Index. During the election year, PEJ has added special coding to more closely examine coverage of the race for President and renamed the work the Campaign Coverage Index. The full NCI data runs at the bottom. The CCI measures both the nature of the campaign narrative and the amount of coverage devoted to each candidate. The race for exposure is measured by the number of stories in which a candidate plays a significant role (as a subject of between 25% and 50% of the story) or a main newsmaker role (at least 50% of the story). 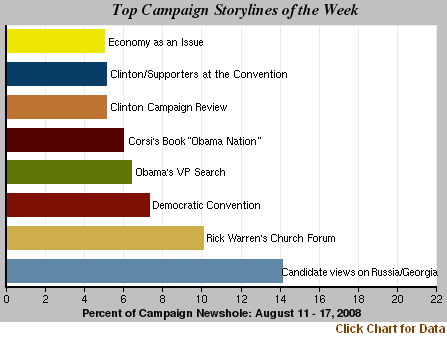 The campaign storyline of the week—the specific themes that make up the campaign coverage—are measured as a percentage of overall coverage, or newshole. Another 5% of last week’s coverage involved a post-mortem of the Clinton campaign, some of it stemming from a much-discussed Atlantic magazine article. Among other things, the Atlantic story reported on Clinton advisor Mark Penn’s advice—not taken by the candidate—to target Obama’s “lack of American roots,” which some critics think has a continuing resonance in the argument about Obama now coming from Republicans in the general election. All told, stories related to Hillary Clinton, Democratic disunity, and the upcoming convention accounted for 20% of last week’s campaign coverage. Overall, the campaign accounted for 21% of the newshole as measured by PEJ’s News Coverage Index for the week of Aug. 11-17. But it was the No. 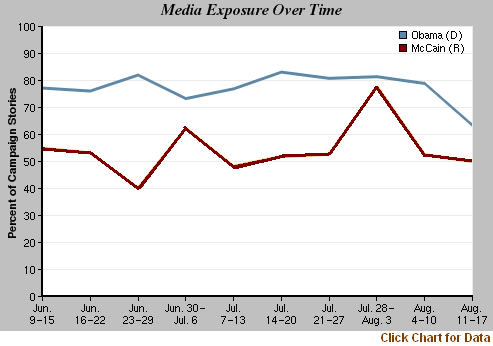 1 story in only one media sector—cable news where it accounted for 44% of the airtime studied. The war between Georgia and Russia, at 26%, was the top story in newspapers, online and in the radio sector. (The last time another story trumped the campaign was Nov. 4-9, 2007 when a state of emergency was declared in Pakistan.) And if one combines the 26% of the newshole devoted to stories about the conflict with the coverage that focused largely on the presidential candidates’ positions, the subject actually accounted for about 30% of the overall coverage last week. The week began with the first full-blown foreign crisis of the presidential campaign, the conflict which quickly put the U.S. at loggerheads with its old Cold War rival. McCain’s tougher stance toward the Russians combined with more cautious language from the vacationing Obama created a sense in the media that the Republican was benefiting politically. The next night, in a discussion on MSNBC’s Hardball, Democratic strategist Chris Kofinis said Obama had done “a pretty good job” handling the crisis. His Republican counterpart John Feehery was less measured. He talked about a “stature gap” between the two candidates on foreign policy. “I think it really hurt Barack Obama that he didn’t come off his vacation and come back and look presidential,” he said. If Russia was the top international concern last week, Obama’s primary domestic political challenge in the press seemed to be dealing with the fallout from the primary campaign. An Aug. 12 Associated Press article on AOL News was one of many that focused on the Atlantic’s reporting about Mark Penn’s blueprint for beating Obama. The story included Penn’s idea that Obama’s "lack of American roots" made him vulnerable. And it quoted a Penn memo (“Won’t a single tape of Wright going off on America with Obama sitting there be a game-ender?") essentially hoping for a smoking gun in the relationship between Obama and his controversial pastor, Rev. Jeremiah Wright. The agreement to place Clinton’s name in nomination at the convention in Denver spawned plenty of media commentary suggesting peril for Obama. “A roll call of the states with delegations methodically announcing tallies has the potential of turning divisive. Emotions attached to each candidate are still raw,” declared CBS correspondent Dean Reynolds on the Aug. 14 newscast. As if to illustrate the point, the story then featured a clip of a Clinton backer confidently predicting that her candidate will be the next President. Nonetheless, more than two months after the primary battles ended, the question of “what does Hillary want?” (and her supporters, too) is still attracting plenty of media attention. One possible beneficiary of all the big news last week was former presidential candidate John Edwards. The still unfolding saga of his extramarital affair was the No. 4 story, filling 4% of the newshole—a number that might have been higher had attention not been focused elsewhere. Finishing up as the week’s No. 5 story (at 3%) was the state of the U.S. economy. Note: As a result of Beijing 2008 Olympics special MSNBC programming, MSNBC’s daytime programming and Race for the White House did not air as usual and were excluded from our dataset for this week. Also due to technical errors specific to August 15, the following Fox News shows were not included: Special Report with Brit Hume and O’Reilly Factor.